I love chocolate! And one of my favorite chocolaty desserts is brownies! 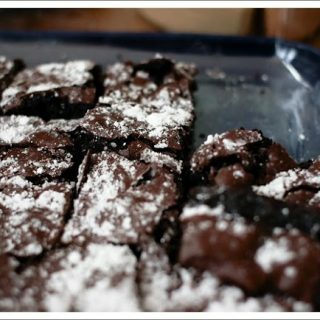 After I stopped eating eggs, I tried making eggless brownies several times without success – no matter what egg substitutes i tried, they always turned out hard and oily. While i was at Berkeley, a friend of mine always brought amazing eggless brownies from home made by his aunt!! Moist, chocolaty, and perfect! I finally got the recipe and have been making them ever since – they’re easy to make and turn out great each time! The brownie recipe below contains dairy. I’ve come across another vegan brownie recipe which I’ve heard works really well. I’ll be sure to post it as soon as I try it. These delicious brownies come together in no-time. 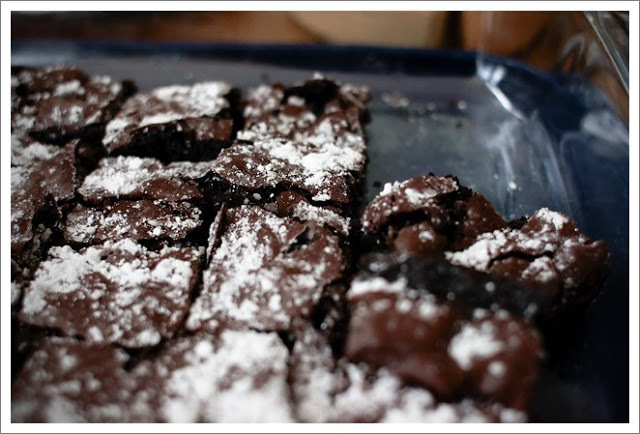 Find out how to use package brownie mix and turn it into an eggless treat! Add remaining liquid ingredients and mix on low speed with an electric mixer or by hand with a spatula. Lightly grease the bottom and sides of a 9x13 glass baking tray with vegetable oil. Next, lightly sprinkle and rub some flour on top of the greased tray. This will help keep the brownies from sticking to the glass tray after baking. Bake for the time indicated on the package or until brownies are done. Let them cool completely. Sprinkle powdered sugar on top and serve. Is there a way to make this without the mix? Hi there! Unfortunately this brownie recipe works specifically with brownie box mix.I'm currently working through a few more brownie recipes from scratch that are eggless, so stay posted for an update!In the meantime, here is another one of my favorite eggless brownie recipes from scratch!